The style portal for males seeking up-to-date information in: fashion, travel, technology , lifestyle, business trends and relevant happenings. Kim Kardashian and Reggie Bush traveled a might long way to execute the mastery you witness radiating above. Both decked in deep blue fitted selections, the couple equally compliments one another. Keep up the great work! 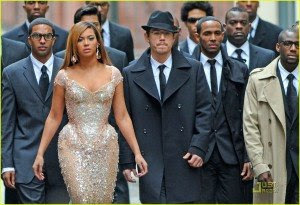 Beyonce glittered NYC streets in a shape-accentuating jeweled frock last week. Of course she caused mayhem. The backdrop style players however oozed mucho style boldness. A big Peace greeting to her subject who Mr. MSR calls brethren. When I saw this shot I shrieked, "It's about time Nick! Show the masses you can lace on a sharp suit and command respect!" And top it off with glossy curve-toe shoes to boot. 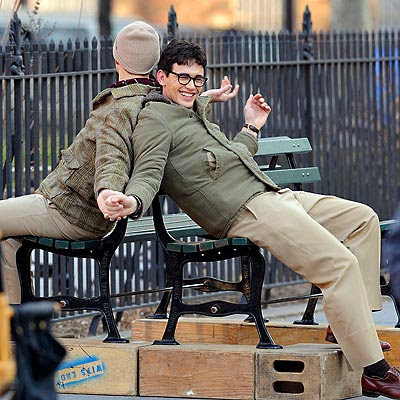 James Franco on set looking retro chic for his movie character! The first shot of Amber Rose and Kanye West that made me pause, analyze, and commend. Amber's neon green motorcycle jacket and Kanye's rose pink cardigan are staples for the pair's sidewalk flair. Speaking of sidewalk flair, Gossip Girls' cast mate lovers strolled with their white pooch all while cornerning a hipster-esque style appeal. PS: Does anyone know the maker of Ed Westick two-tone awesome olive boots? What more can I say other than that the girl has swagger-a-million! The natty, cultured, debonair that appreciates and reports on Male Style! MaleStyle Review claims no credit for any images featured on this site unless otherwise noted. All visual content is copyright to it's respectful owners. If you own rights to any of the images, and do not wish them to appear here, please contact us and they will be promptly removed. MaleStyle Review is in no way responsible for, or has control of, the content of any external web site links. Information on this site may contain errors or inaccuracies; the site's proprietors do not make warranty as to the correctness or reliability of the site's content.